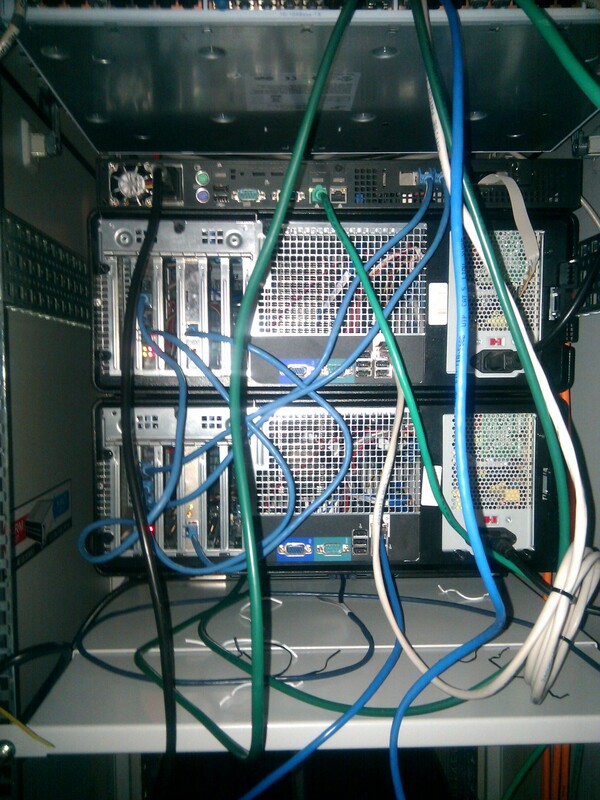 To ease the debugging of crashs or locking issues and to remove noisy and heat generating equipment from our office 19″ rack, I have moved test systems for BRI and PRI into our rack at the Level3 datacenter in Berlin. The machine on the bottom is acting as the remote side, running unmodifed Asterisk 1.4 and 1.6 versions. It’s equipped with a quadBRI and a TE110P card and provides BRI and PRI “connectivity” to the BRIstuffed box sitting on top of it, which is equipped with a quadBRI and a singleE1 card. It also provides “connectivity” to the 1U box which is equipped with a “still secret” card that has a JTAG cable dangling out of the chassis. Mainly we run tests that include SIP -> ZAP or ZAP -> ZAP calls, or any combination of those. Those calls are usually very short and timed to provoke “answer/hangup” and “hangup/hangup” collisions. With the audio output of the phone set to “headset” it can run for days without emitting any disturbing tones (like when things have locked up…and lock up they will!!! ).